This post is dedicated to the outstanding group of health conscious individuals who attend meetings of the newly formed Nourishing the Lakeshore of West Michigan chapter of the Weston A. Price Foundation. 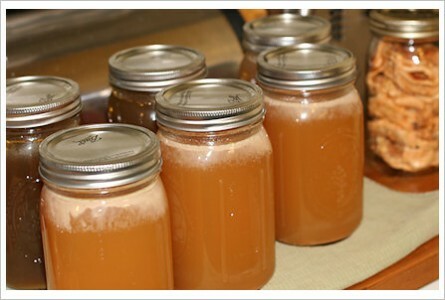 Sally Fallon Morell, the author of Nourishing Traditions and co-founder of the Weston A Price Foundation shares some thoughts about bone broth here. The reason to use bone broth is 2 fold. One – it is key to good health and two, having it on hand makes preparing delicious meals in the kitchen so much easier. Bone broth provides electrolyte minerals from bone, marrow, and cartilage (calcium, magnesium, phosphorus, silicon, and sulphur). Since minerals are extracted from natural living tissues, they are in the ideal balance and form to be easily taken in and used by the body. You could call broth the ultimate mineral supplement. It works to accelerate overall healing and supports our bones, joints, teeth, digestion and immunity. It is an ideal “prescription” for any disease and a wonderful preventative of future illness. As a mental health professional, I am excited about the prospects of better mental/emotional health due to improved digestion and assimilation. Ramiel Nagel in his book Cure Tooth Decay says broth is one of the most potent medicines for reversing and preventing tooth decay. He recommends 1 -2 cups per day either drank by itself or used in soups, stews or sauces. Bone broths also provide gelatin which attracts digestive juices to itself and thus helps us utilize proteins and other nutrients more completely. This is helpful for those on a tight budget (who can’t afford to buy a lot of meat)…since it allows the body to make better use of proteins. Gelatin also prevents bad bacteria from attacking the gut wall neutralizing them so they don’t cause problems for us. There is a significant amount of research proving that gelatin can heal chronic digestive disorders (by balancing stomach acid to normal levels), Crohns Disease, colitis, irritable bowel syndrome – all of which are on the rise, especially in teens and young adults. Who’s heard of glucosamine and chondroitin? These supplements for joint health have been proven to reduce arthritic pain and swelling…and they’re in bone broth – again in the natural form your body recognizes. One important note: use bones with integrity, that is from animals who have grazed out in the sun eating grass and non-gmo feeds. The bones from these animals will have more minerals and little or no toxins (like arsenic) than those conventionally raised. The ideal is to know your farmer. Can be made from raw chicken, either whole or cut up into parts, or you can use the bones from a prepared chicken meal. Skin adds flavor and additional nutrients. and let sit for 30-60 minutes – this starts the process of drawing out the minerals. Bring pot to a boil and remove the “floaties” that rise to the top – don’t worry if you don’t do this. Cover and simmer 6-48 hours. 10 minutes before removing from heat, add a bunch of parsley for added minerals. Then remove the bones; you can use the meat in recipes. Throw the veggies in your compost pile. Strain into glass bowl or jars. Put in the frig until the fat solidifies on top…scrape it off and you can save it for sautéing vegetables. 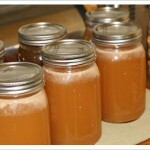 Store 5 days worth of broth in the frig and the rest in pint and quart jars in the freezer. LABEL with date and type. If you want to store in plastic…make sure the broth is cool and the plastic safe. Broth keeps several months in the freezer…you’ll use it up way before that. Best bones are knuckle, marrow, meaty rib, neck and tail. Again…local and grass fed is best. For those who are just beginning or get overwhelmed with too many details, brown some bones in a 350 degree oven for about half hour, put them in a kettle with good clean water, a chopped up onion, chopped carrots and celery and a tablespoon or 2 of raw apple cidar vinegar and let stand for an hour or two, bring to a gentle boil, then simmer for 6 – 72 hours. If you have reason to believe your gut is leaky, stick with 6 hours or less. Glutamate is created after a lengthy simmer, so using the broth after 6 hours may be more safe for those with intestinal permeability. Just DO it. You can master the details later. In a big pot place about 4 pounds of marrow and knuckle bones and 1-2 T Vinegar for every quart of filtered water – let this stand about an hour. In the meantime, brown about 3 pounds of meaty rib and neck bones (in a shallow casserole pan) in the oven at 350 about 20 minutes per side. Then put them in the water . You can pour out the fat, add water to the pan and scrape it to get those yummy drippings unstuck and then pour that into the stockpot. Add your choice of veggies if you like. Bring to a boil. Skim off floaties – this is more important with beef than chicken. Turn heat down and simmer for at least 12 and up to 72 hours. The longer it cooks, the richer the flavor. Again, the last 10 minutes, you can add parsley for extra minerals. Remove bones, strain into glass bowl or jars, cool, remove fat. There are times when I know I’m going to use the stock for a casserole so I just leave the fat in it…as we’ve learned these are healthy for us. It all depends on your taste. Pour into storage containers and LABEL. How can you use your broth? Anytime you are making soup, sauce or a casserole, it is a delicious healthy addition. You can also start your day with a warm cup of broth, a touch of sea salt, and that wondrous coconut oil we’ve talked about recently. ***For economy – re-use your bones, adding new bones with cartilege each time. It is not advisable to buy most canned and boxed soups and broths as well as boullion cubes and powders even if they are labeled organic – they have all sorts of unwanted substances like MSG, artificial flavors and trace amounts of the material in the container in which they are packaged. Wishing you REAL food, for REAL health so you can be REAL happy. More reading from Sally Fallon Morrell – Broth is Beautiful. And the book Nourishing Broth, by Sally and Kaayla Daniel, Ph.D.